I needed to try something from this place that kept catching my eyes on instagram so I called and ordered for “one of every nice thing available”, thankfully the bill was on 007! First best thing, my treats were delivered by a hunk in a Mercedes Benz! Packaging looked “sophisticat” too…. By now, some of you know I love Bubbletti and as usual, both cups were such darlings…. We do not have a lot of places that make good cheesecakes in Lagos so whenever I find them, I’m overjoyed! Even though, I am not the greatest fan of both chocolate and caramel (yes, be shocked), I would definitely be going back for these babies. My best part is the fact that both crusts aren’t your typical graham crackers. I was too engrossed in savouring every bite that I did not bother wondering what exactly they were, all I know is that the crunch game was real! Hint: When you slide your spoon into that chocolate goodness, you are in for a pleasant surprise. One of my favorite words to say in French is actually “croissant”….. Honestly, I was disappointed when I bit into this because when I think croissants, I think layers of light, airy, flaky goodness….but as you can see from the picture, this was dense and layerless. Now, I know you are wondering why I am speaking on it since it did not meet my expectation but the truth is, I actually loved it! Not as a croissant but as “something else” *laughs* maybe bread. It was warm, chewy, buttery and full of homemade love. I just wish it had a different name…. I had the coffee and chocolate filled donuts and they were juiceee *singing*. This is my new donut making standard goal (Sandy, take note *tears*). My favorite…profiterole! Yes the pastry, was light and the yes the cream was delicious. I fell so in love that when @eventswithcarmen asked where we could meet up to pick a winner for out Valentine’s day giveaway, all I blurted out was “XO bakery so we can even have their profiteroles”…. We had a cream filled donut, profiterole and coffee hazelnut! Donut didn’t disappoint! Filled with luscious warm cream melting in my mouth…. In just about 5 bites, these donuts disappear because of how soft they are and no, my mouth is not big. To love this, you would have to be chocolate lover! I had about 3 forkfuls and realized I cared more for the filling than for the crust so I got a pack of biscotti and used the coffee filling as a dip. Still my favorite! I love how shiny and delicious it looks and the gold dust on top….love love! 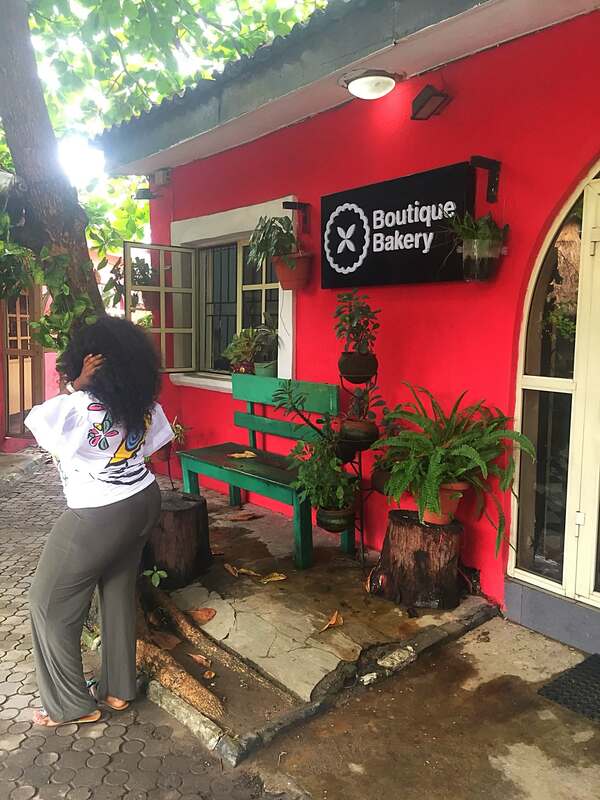 So XO bakery is a small space with some African feel to it, peep the decor. You can always sit outside in a gorgeous sitting area though, it is located in the same compound as La Taverna…..48, Balarabe Musa Crescent, Victoria Island, Lagos. This is our latest JJC in town (meaning Johnny just come, Nigerians will get the joke). I won’t speak much on them because some of these franchises come here and start off amazing then begin to give us less quality at ridiculous prices. But for now, Pinkberry is dishing out really good stuff…. I went in with the little brother and H-Baby….Apart from the fact that it takes a lot if time for you to actually get your goodies, we highly recommend every thing we had….bubble waffle, frozen yogurt flavors: original, passion fruit and wild berry, my favorite topping….red velvet cake! Someone at the store got this and I had to take a picture! Another JJC we are expecting is Krispy Kreme, they handed out free boxes of donuts at The Palms, Lagos yesterday in anticipation of their store opening. I am trying this as soon I am in Nigeria!!! Wooooooow!!!! Infact let me order for someone first. Thank you ify boo for this! 😂 Such a foodie….we are waiting for you! All i can think of is having a profiterole and pinkberry yoghurt together. Everything just looks so yummy!!! All of a sudden I’m craving a bowl of pink berry goodness 😭. In South Africa, we call it Waka Berry and it seems to be the same concept: Frozen yogurt with toppings of your choice. Really lovely confectionery shop too. All their stuff looked pretty professionally done I must say. You should order again to say Hi to Mr in the Mercedes 😂.